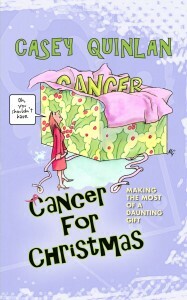 Cancer for Christmas: Making the Most of a Daunting Gift became an Amazon Bestseller on Friday, Oct. 30, 2009. I got cancer for Christmas in 2007 and lived to tell the tale, which has made me passionate about helping people become active participants in their medical care. Whether it’s just the usual slings and arrows of life, like falling off your bike or any other sports injury, or you’re facing the fight of your life – cancer, multiple sclerosis, or any other life-changing medical news – you need to participate in your care. I liken medical treatment to a car wash, and ask if you’d like to go through the car wash inside the car, or strapped to the hood? Ask questions, stay inside the car. Demand answers you can understand. Work with your medical team to find the right path for you. Don’t ask questions, and you’re strapped to the hood, with predictably unpleasant consequences! Published by Peppertree Press and now in its 2nd edition, the book is a fast, fierce, and funny ride from diagnosis to recovery, with a full list of lessons learned along the way. Connect with C4C on Facebook!